'Hemingway Didn't Say That' (And Neither Did Twain Or Kafka) There are tons of quotes from famous people out there — and a lot of them are just plain wrong. Author Garson O'Toole has dedicated himself to setting the record straight. Author Garson O'Toole has a simple explanation for why quotes are often wrongly attributed to Mark Twain: "If you preface a quotation by saying it's from Twain, then people are prepared to laugh at it." Earlier this year, the Republican National Committee marked Abraham Lincoln's birthday by sharing a charming, if banal, aphorism attributed to Lincoln: "In the end, it's not the years in your life that count. It's the life in your years." The problem is there's no evidence Lincoln ever wrote or said it, which critics on Twitter were only too delighted to point out. The RNC took down the tweet, but all that trouble could have been avoided if they'd first checked in with Garson O'Toole. That's the pen name of a man who has tracked down the true origins of hundreds of quotes on his website, Quote Investigator. 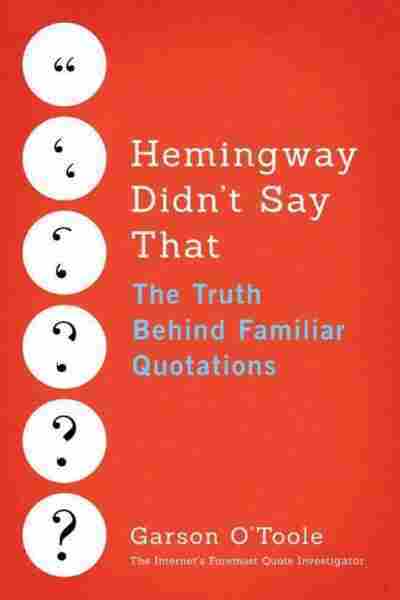 O'Toole has collected some of those investigations into a new book called Hemingway Didn't Say That: The Truth Behind Familiar Quotations. He says, "It's a lot of fun to uncover these hidden histories, and I'm also very glad when I get to give credit to the person who actually said it." Mark Twain is known for having a fantastic sense of humor, and if you preface a quotation by saying it's from Twain, then people are prepared to laugh at it, to think that it's wonderful. 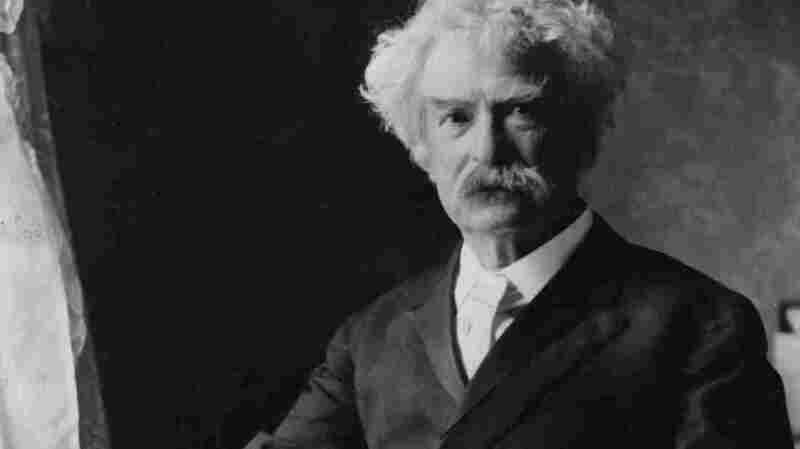 Many quotations, they're anonymous or from lesser-known comedians reassigned to Twain. There might be a joke and somebody would say it's Twain-like and then the next person will say, "No, actually, it's from Twain." The earliest evidence that I was able to find was a 1907 book by Maurice Switzer. And it seems to contain a lot of original material and it includes the statement "It is better to remain silent at the risk of being thought a fool, than to talk and remove all doubt of it." So it's slightly different phrasing, but I believe that is what evolved to generate the modern common version. "Don't bend; don't water it down; don't try to make it logical; don't edit your own soul according to the fashion." ... It was in an introduction to a collection of stories by Franz Kafka, and she was talking about how she'd been inspired by him. It was her perception of the way Kafka thought when he was writing his stories, but somebody reading that introduction thought that it must have been Kafka that said this instead of Anne Rice and so it started being distributed in that way. I got an email from an individual who said that on Facebook Anne Rice had posted this quotation and she had attributed it to Kafka. And so that was enormously confusing to me because I thought that if anyone would be able to recognize that quotation, it would be the person who created it. So I sent a Facebook message to Anne Rice; she replied very quickly and said she would look into it to try to find out who actually created it. And then she came back with another reply saying that she'd discovered that in fact it was her words and that she had written it in this introduction, and as evidence of that she gave me a URL that pointed to my website. ... And it's understandable: She's written a large number of words and she'd written this more than a decade in the past. Many of these quotations are cultural landmarks. They affect the way we think about, say, environmentalism. Let me find this quote: "We do not inherit the Earth from our ancestors; we borrow it from our children." That's been attributed to Ralph Waldo Emerson; it's considered a Native American proverb; an Amish saying. But the earliest evidence I found: There's an activist named Wendell Berry and he was discussing good stewardship of the environment ... and I think he deserves credit for this kind of a cultural landmark. Editor Melissa Gray and digital producer Nicole Cohen contributed to this story.